MacMillan, Scholz & Marks, P.C. is pleased to report that partner Christine Reinert was selected as a Rising Star in the state of Oregon by Super Lawyers Magazine for the fourth year in a row. Super Lawyers is a rating service of outstanding lawyers who have attained a high-degree of peer recognition and professional achievement. To be eligible, the attorney must be 40 years old or younger, or in practice for 10 years or less. The selection process includes independent research, peer nominations and peer evaluations. 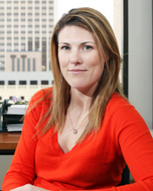 Christine was selected as a Rising Star in the area of Construction Litigation.